Go on an interstellar odyssey, right here in Pune. Space is so vast that it would take billions of years for a rock ejected from the earth to collide with a planet circling another star. The stars of the Milky-Way are drawn together by gravity in their own enormous orbits around its center. The sun, for example, being way out on the edge takes some 2250 million years to complete a single orbit. At the same time, during each revolution around the galaxy, the solar system will pass through three gigantic interstellar clouds, planet making factories each many light years across. The Milky-Way has more than 100 of these vast clouds, places where gas and dust condense to form new stars and planets. The best way to start exploring the night sky is with the naked eye. Under the guidance of experts, you’ll learn to identify the constellations and stars, and that’s only the beginning! This stargazing night has been organized in association with Jyotirvidya Parisanstha (JVP) on Saturday the 3rd and the 4th of November, at Nasrapur Farmhouse location. 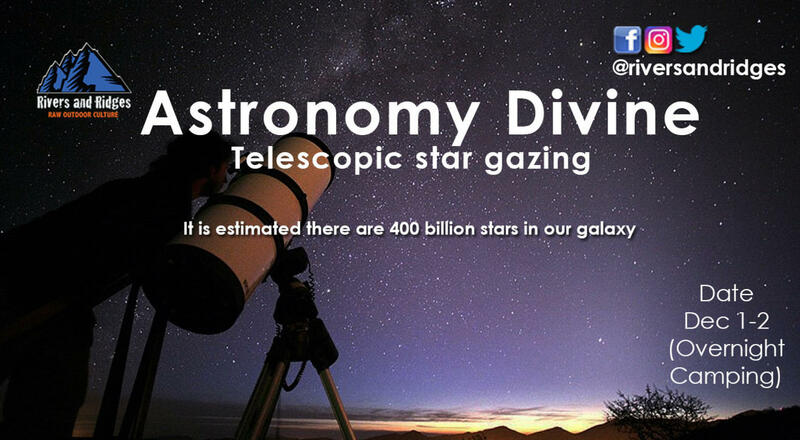 Kindly note: The star gazing activity starts pre-dinner and will go on till 7.30 AM. Those who would like to sleep early, there will be tents set up for you to sleep in (on sharing basis); others who wish to stay awake throughout, kindly get enough rest during the day on Saturday or prepare to get rest once you head back on Sunday. Sky shows (total 3): One of the JVP experts will explain to participants about stars, planets, constellations, Raashis, Nakshatras, their mythological stories as well as interesting scientific information. Telescope sessions (total 4): Through JVP’s telescopes, participants will get to see mind-blowing views of the Moon, Jupiter, and some deep sky objects like Orion Nebula, Beehive cluster, Omega Centauri cluster, Ring nebula, Hercules cluster, etc. Software demo: One of the experts will demonstrate a free planetarium software that you can use with your laptops, tablets or cellphones. You’ll also get to see some bright satellite passes (and hopefully meteors!) with an unaided eye! Perfect if you like seeing yourself as part of a bigger picture, with a sense of wonder, and just love being out at night. If that's you, come and join in for a slumber party under the stars. Pick up from and drop off at Restaurant Blue Nile. This is a great event and has many unusual sights. Please do not expect this as a party invitation and completely avoid alcohol or substances. Once you are ready, please contact the organizer and reserve your seat. Feel free to ask any questions that you may have.